Go outside on the next clear night and take a look up at the heavens. Take a moment to marvel at the sight of scores of stars at a distance of dozens, hundreds or thousands of light years away and wonder. Wonder if any of it is real. The world we call home can be a mysterious place, but when compared to the Universe as a whole there is very little in the way of competition. In the last two decades or so, a plethora of exoplanets have been discovered and announced. Some of these defy all current understanding of physics and logic and only offer more questions than answers. Perhaps that what science actually is. But what if someone’s science has engineered a virtual-reality universe for their own possible amusement. A virtual universe is an idea that some science-fiction productions have entertained. From Jean-Luc Picard’s holodeck to the X-Men’s Danger Room. Using computer generated interfaces they have the capabilities of creating any simulation that an imagination can muster. In 1999, this idea was the basis of a film that revolutionized the industry. 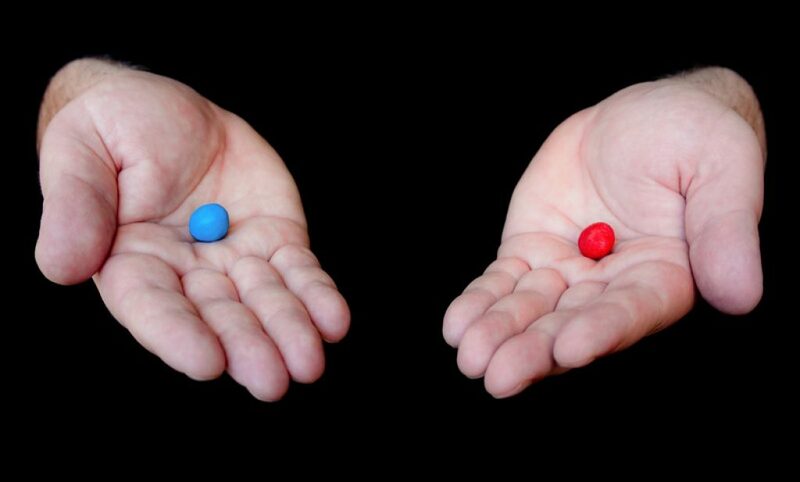 It began with the protagonist facing a simple enough looking proposition: You take the blue pill – the story ends, you wake up in your bed and believe whatever you want to believe. You take the red pill – you stay in Wonderland and I show you how deep the rabbit-hole goes. There are those who firmly believe that this so-called rabbit-hole is a real concept. The five senses are by no means perfect and are easily tricked under the right circumstances or with the right conditions. A talented magician can exploit these deficiencies to create the illusion that he or she can perform wonders beyond all basic comprehension. Of course much of this is simple misdirection, fooling the audience into looking in one direction or at one thing while the distraction covers what is really going on. But trickery goes well beyond the likes of Dynamo or David Blaine. Even the simple everyday concept of money can have similar effects. All money is in reality is printed paper. Most of us has a job which earns a wage at the end of the week or month, but usually we want more than we get. How many people play the lottery and not wish to win the main prize? Of course none of this compares to running up and along walls, dodging bullets with physics defying bullet time skills or impossible acts of human abilities. Imagine if we had a similar choice between both pills. How can we tell if we really are living inside a Matrix? In 2001 scientists made their first serious attempt to calculate what resources that a universe sized simulation would be required. The conclusions made a prospect like this virtually impossible. In order to replicate the perfect facsimile of known reality to the last atom would require more energy than the universe itself holds. The computer hardware would have to be larger than the universe and time would pass slower inside the program than outside of it. MIT scientists decided it was not worth the effort to construct it. Inspired by the MIT studies, other scientists continued this study and used a less perfected copy of the universe model that was good enough to satisfy the virtual inhabitants and didn’t need nowhere near as much computational power. Technological advances over recent years do mean that even today’s more modest mobile phone has more computing power than NASA computers during the 1960s space race. Modern supercomputers can now accurately design a crude model universe which can chart and monitor infant galaxies and clusters. It won’t be too long before these simulations can include representations of virtual life-forms. In such simulations, the motion of virtual particles has been calculated to be related to the distance between separate points within the lattice being used. The motion of these particles – and therefore the energy – has a direct correlation to the size of the grid being used. The smaller the grid, the higher the energy these particles have. All of this means is that assuming our universe is a simulation, a maximum energy amount for the fastest particles can be observed. Incredibly, astronomers have recorded cosmic rays originating in distant galaxies arrive at Earth at a constant maximum energy of about 1020 electron volts. Astronomers have also concluded that if deep space is continuous and with no underlying lattice structure, they should arrive uniformly from every direction. With the addition of an artificial lattice, then this distribution would be affected accordingly. If this change can be detected, then it would lend considerable weight to the theoretical idea of a Matrix-like universe. To get an answer of this magnitude would require more than just data gathered from incoming cosmic rays. There is a major flaw behind these studies. If we are located somewhere inside a computer simulation, then any and all results would be based on the laws of the simulation being run and not the natural laws of physics. Whatever results that are discovered will already be skewed by the limitations of the program being run by those outside. Another question that has to be asked is who is behind all this and what is going on in their world? Would you risk the red pill to find out more?